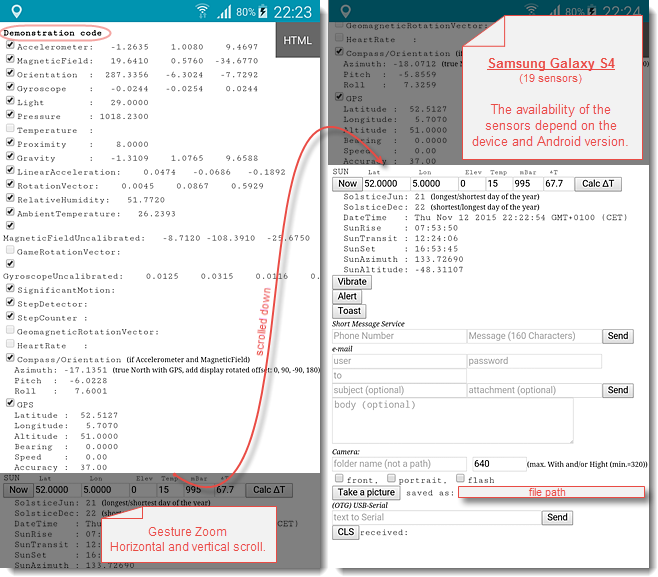 Use this Android WebView APP and write the code directly in HTML+JavaScipt. Save your html and js files on SD and load them in the WebView with the HTML-button (last img. step 1). WARNING: Protect your self wen using Android WebView, use only locally stored files!!! (depends on hardware and Android version). Short message in a small popup. At an event, send a sort message. Send an e-mail at alarm or other event. To one or multiple adresses (separated by a semicolon). With or without an attachement (photo, file: /sdcard/camtest/<name.ext>). You must have a gmail account! Adjustable maxium height/width in pixels. Front, back and flash options. Save to folder of your choice (default folder camtest). Returns file name and path. (OTG) Serial communication with ESP8266, Arduino, ... .
Sunrise, sun transit, sunset, position of the sun, longest and shortest day of the year. NREL's Solar Position Algorithm (SPA), calculates the solar zenith and azimuth angles in the period from the year -2000 to 6000, with uncertainties of +/- 0.0003 degrees based on the date, time, and location on Earth. Ideal for a suntrack system. Communicate over (W)LAN and Internet with my ESP8266(+Arduino) Publish/Subscribe project. Use HTML5 Canvas for a graphic UI, get a Widget library or goto jQuery Widget Factory. 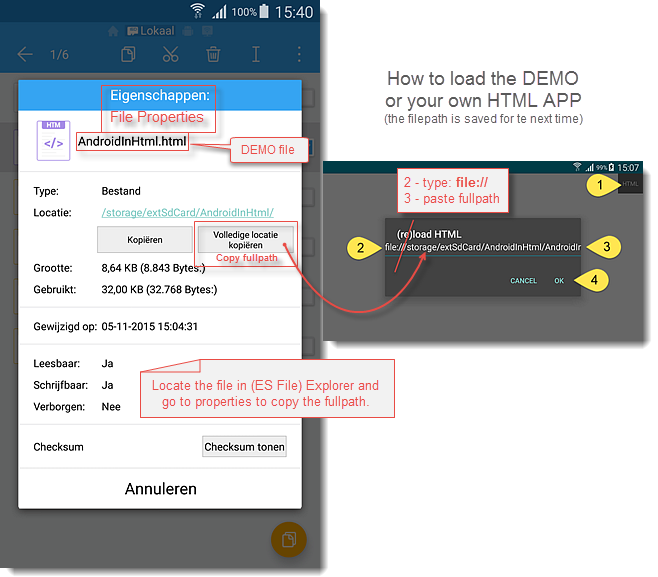 TIP: Use (ES File) Explorer to copy the fullpath ;-) and follow steps 1-4.